Have you ever wondered: how much does skydiving cost? In short – the average price of a skydive in the USA is around $300, but that can vary from dropzone to dropzone. It even varies sometimes on the same dropzone, considering the fact that seasonal and special tandem skydiving discounts pop up every once in a while (especially if you follow the dropzone’s social media posts. Hint, hint!). Our skydiving prices page puts our rates out there, easy-peasy, but — if you’re reading this — you probably have deeper questions about the costs of tandem skydiving. Let’s address ‘em, shall we? How much does it cost to go skydiving? The cost of skydiving for the first time depends on how you choose to jump – out-of-the-blue spontaneously or with a reservation (the latter of which is usually cheaper). It also depends if you’re going it alone or jumping with a group (which is generally discounted as the group grows in size). Often, dropzones will offer a discount if you book a second skydive on the day you jump for the first time. What do tandem skydiving prices include? A highly experienced tandem skydiving instructor to accompany you through your experience with us. You’ll benefit not only from their knowledge, but also from their passion for the sport. And they’re happy to share all of it with you. A brief training session, during which you’ll learn about your responsibilities as a tandem student, as well as the equipment and the procedures that keep us all safe up there. 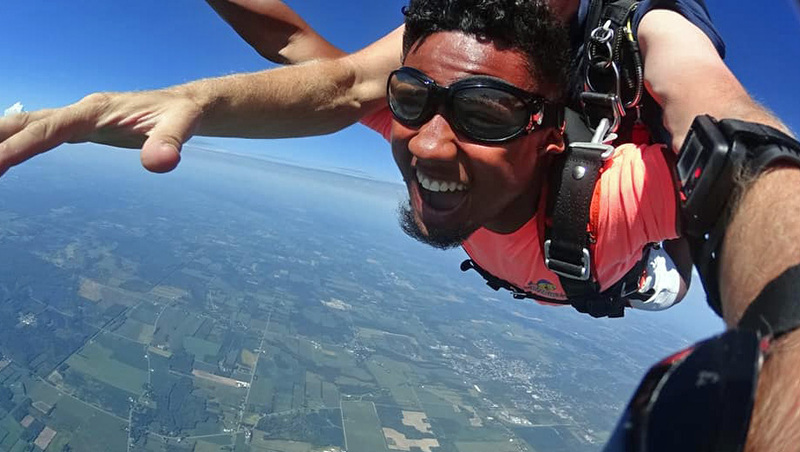 When you choose to make your first skydive with WNY, you can rest assured that you’re jumping with a United States Parachute Association (USPA) member skydiving center. That means that we maintain all of our equipment and aircraft to the highest standards. Are there any additional skydiving charges I should know about? Want proof of your incredible skydiving adventure? Then, to the price of the skydive itself, you’ll be able to upgrade your jump to include skydiving videos and pictures. For just a few extra bucks, you’ll get a bunch of high-quality photos and a truly jaw-dropping video to share with family and friends. SO worth it! How much is skydiving near me? Are you located in or around Western New York, or plan to visit Buffalo, Rochester or the Finger Lakes area? Yes? Then we can tell you exactly! Do yourself a solid and book online today. Can Weather Affect My Skydiving Day? Can You Breathe While Skydiving? Get news and updates in your inbox! WNYSkydiving is a member of the United States Parachute Association. Copyright © 2019, Western New York Skydiving, All Rights Reserved.